The new trial date is scheduled for April 5th, 2017. Mark your calendar. Yesterday there was a dispositive motions hearing in the Camping Ban criminal cases where homeless and poor people are being charged with crimes for sleeping on the streets with blankets and shelter in Winter. The hearing was noteworthy for the bias and prejudice shown toward Defendants by the Court. 1)At the start of the hearing, prior to any argument, the Judge looked at Defense counsel and said: “The one thing I don’t want is any drama from you, Mr. Flores-Williams.” Defense counsel had never practiced in this court. 2)Without allowing any substantive legal argument, the Court ruled that it was permissible for theProsecution to file a 34-person witness list eight days after the court’s deadline and only two weeks prior to trial. 4)The Court then ordered Defense counsel to limit all arguments so that no argument or line of questioning could be construed at trial as an attempt to persuade the jury that the Camping Ban ordinance is itself unjust. 5)At this juncture, defense counsel cited to Fed R. 37(c)and its CO equivalent concerning the prejudice resulting from late disclosure of witnesses. No court response. Defense counsel then quoted from sections from Chambers v. Mississippi, a landmark 1973 civil rights case concerned with due process in which the overall prejudice to defendants becomes so cumulative and egregious that defendants fair trial rights are eviscerated. No response. 7)Defense counsel then objected to the fact that the court had asked the prosecution for their jury instructions without asking defense for their jury instructions, and now was reverse engineering the court’s ruling from the prosecutions jury instructions. Objection overruled. 8)Defense counsel made oral motion for the judge to recuse, i.e. that he Judge take herself off the case for bias against defendants. Denied. 9)Defense counsel cited to several cases concerning due process rights, wrongful exclusion of defense witnesses, and the right to fairly address criminal accusations. No response. 10)Defense requested findings of law and fact – none given. 11)Defense counsel asked for a stay of the proceeding to file an interlocutory appeal regarding the court’s rulings. 12)Court stated that interlocutory orders cannot be appealed from municipal court so that none of the court’s decisions are reviewable. 13)Court ruled that the prosecution’s disclosure of 95 police body cameras three days prior to the hearing was permissible, then scolded defense for not reviewing the 95 videos prior to hearing. Defense counsel, concerned that the court would issue sanctions if he responded, had no comment. We are now seeking an interlocutory appeal of the Court’s rulings. The trial is scheduled for April 5th, 2017. Mark your calendar. 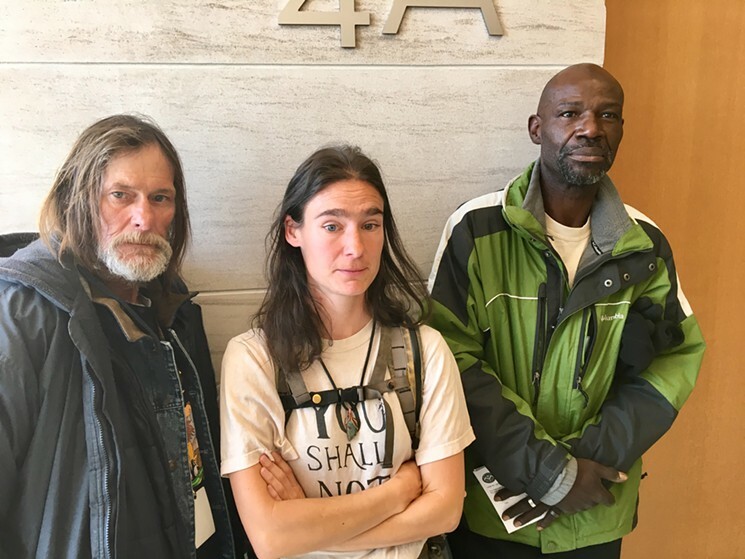 On February 16th, 2017 2:30pm at the Lindsay Flanagan Court House Jerry Burton, Terese Howard and Randy Russell will have a motions hearing for their case under the changes of “unauthorized camping” which is defined as “using any form of protection from the elements other than one’s clothing.” These three individuals are facing, according to the law, up to $999 or a year in jail for the crime of using blankets to try to stay warm on a cold winter night. The city has dedicated massive resources to continue to prosecute these individuals for using protection from the cold weather. The city feels so entitled in its treatment of the poor and homeless that it submitted a 34 person witness list 7 days after the court deadline and only two weeks prior to trial. This motions hearing will determine if the city’s witness list, 33 of which are police, will be accepted or denied. 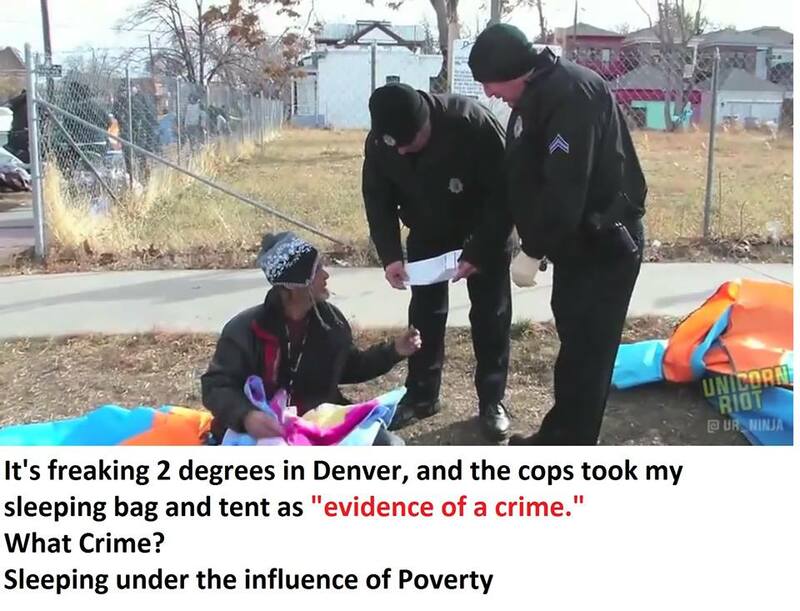 After these viral videos surfaced of police taking Burton and Russell’s blankets and tents “as evidence” of their crime of camping first at 27th and Arapahoe where they had been surviving for months and second at city hall where they moved in front of the Mayor’s office with no where else to go; and after lawyers informed the city they would be filing a temporary restraining order against the city of Denver for putting people’s lives at risk by seizing homeless people’s blankets in freezing weather, Mayor Hancock gave a public directive to the Police Department to stop taking homeless people’s blankets and survival gear when enforcing the camping ban (but only until April when apparently the Mayor thinks that people won’t need any blankets or protection to sleep outdoors). The problem is this is not a game – this is people’s lives. Burton, Howard, and Russell have pleaded not guilty and will be bringing their cases to trial together as a joint trial, represented by attorney Jason Flores-Williams. As the City, under the direction of the Mayor, uses our tax dollars to prosecute these cases of public survival while homeless, we will continue to stand up in the courts, city council, state capitol, and on the streets to bring this injustice to an end. Come to the motions hearing on Thursday February 16th.